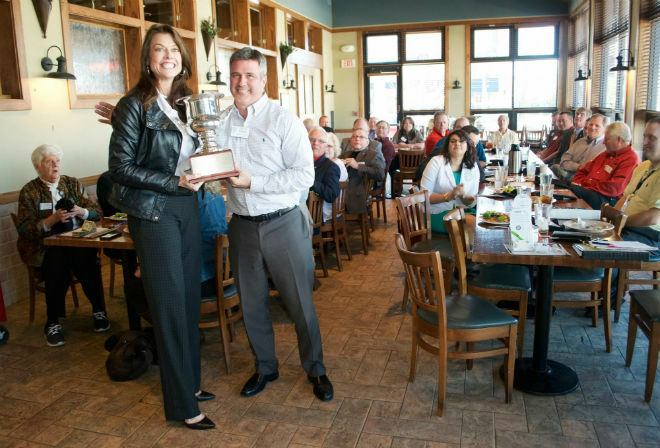 Donice Mahan, Club President joined with Past President Scott Pfeifer to present the club membership with a District 6040 honor, the Klinginsmith Cup. Named after Ray Klinginsmith, who served as president of Rotary International in 2010, this traveling award is presented annually to the Rotary Club with the highest average giving to the Rotary Annual Programs Fund, plus receiving the Presidential Citation. The KCI Rotary Club is pleased to earn this award from District 6040 and looks forward to earning this great achievement for many more years to come!